I wanted to make burritos with black beans in them. I had a delicious one a few years back that has stuck in my mind so armed with this memory I went in search of some burrito recipes. 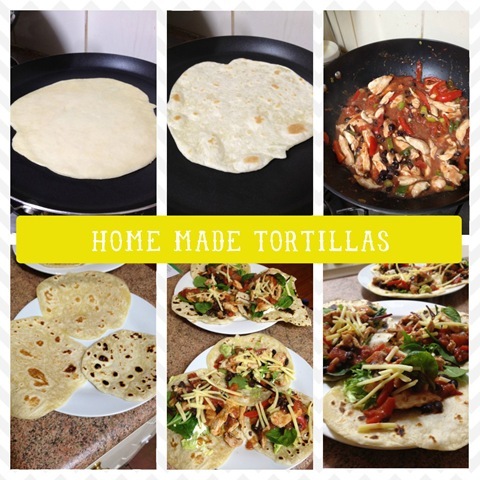 I didn’t find exactly what I was looking for, but I did find this; http://zoomyummy.com/2011/07/27/homemade-tortillas/#. They looked so delicious I just had to try them. The result was wonderful – I’ve since made them again. They’re soft with a hint of chewy, and taste lovely. I served them with a chicken, black bean, capsicum, onion, and taco seasoning mix, topped with some avocado, salad, cheese and sour cream. A definite winner! Hi Renae, amazing burritos! Yummo!